Fifteen year old Regan struggles to find her identity and sense of self. For her whole life, she has lived in the shadow of her brilliant brother, Liam, and his true self, Luna. Liam is transgender, but nobody is privy to this information accept Regan. Liam plays the role of a boy by day, but at night he uses Regan’s clothes and makeup to transform himself into Luna. As Liam grows older, it becomes increasingly difficult to keep Luna locked inside and Liam makes the difficult decision to transition into a woman. Regan loves her brother, but has difficulty accepting his increasing openness about his female self. Regan is afraid that Luna’s emergence into the world will endanger her reputation and ruin her blossoming romance with handsome newcomer, Chris. Things do indeed take a turn for the worst for Liam and Regan when Luna reveals herself to her family and friends; however, Luna’s resilience allows her to strengthen her resolve and make the choices she needs to make to achieve happiness. Regan is equally resilient, and also manages find freedom in truth. Perhaps the greatest strength of this novel is the intricacy of the relationships between the characters. Regan and Luna’s relationship is the most developed in the novel, and it is an exemplary illustration of unconditional love and acceptance. Peter’s really captures the alienation felt by Luna as a transgender teen. This is an important book because it inspires empathy within its readers and gives them insight into a world they may or may not understand. The flashbacks sprinkled throughout the novel are especially insightful, because they reveal that Luna’s gender identity is not simply a phase, but is in fact the gender she was born with. At times Luna is not a likeable character. She is self-absorbed and vain, but nevertheless her courage is inspiring. Regan is a much more enjoyable character, but perhaps this is because the novel is told from her perspective. We do not get to see Luna’s inner thoughts, we only get to see her anguish through the interactions she has with her sister. It would have been nice to have glimpses into Luna’s mind, but maybe Peters chose not to do this because it would change the focus of the book. Regan is keeping a secret, but it is not her own. She must come to terms with the reality that her brother by birth is her sister by soul. According the author’s website, “Julie Anne Peters is the critically-acclaimed, award winning author of more than a dozen books for young adults and children. 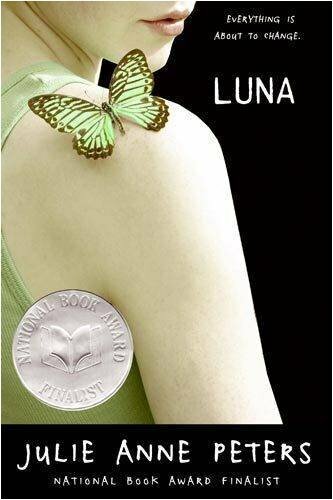 Her book, Luna, was a National Book Award Finalist; Keeping You a Secret was named a Stonewall Honor Book; Between Mom and Jo won a Lambda Literary Award; and Define “Normal” was voted by young readers as their favorite book of the year in California and Maryland. Julie’s books have been published in numerous countries, including Korea, China, Croatia, Germany, France, Italy, Indonesia, Turkey, and Brazil.